The 280-FP Flow Probe is a highly accurate water velocity instrument for measuring flows in open channels and partially filled pipes. The water velocity probe consists of a protected water turbo prop positive displacement sensor coupled with an expandable probe handle ending in a digital readout display. The 280-FP Flow Probe is a highly accurate water velocity instrument for measuring flows in open channels and partially filled pipes. The water velocity probe consists of a protected water turbo prop positive displacement sensor coupled with an expandable probe handle ending in a digital readout display. The water flow meter incorporates true velocity averaging for the most accurate flow measurements. The flow probe is ideal for storm water runoff studies, sewer flow measurements, measuring flows in rivers and streams, and monitoring water velocity in ditches and canals. The flow probe incorporates the unique Turbo-Prop Propeller Sensor, which uses the most accurate positive displacement technique available for velocity sensing. The turbo-prop is designed to shed debris and is protected inside a 2" diameter housing. The probe housing may be placed directly on the bottom of a pipe or streambed for measuring low flows down to 2" in depth. The flow meter propeller rotates freely on its bearing shaft with no mechanical interconnections for minimal friction. Magnetic material in the propeller tip passes a pickup point in the water velocity meter handle producing electrical impulses that are carried to the readout display by an internal cable. The turbo-prop is easily removed for cleaning or replacement. The Flow Probe Handle can telescope from 3.7 feet to 6 feet in length (FP111), 5.5 feet to 14 feet (FP211), or 2.5 feet to 5.5 feet (FP311). The handle is constructed of anodized aluminum for light weight and long life. The 15 foot length of the FP211 Flow Probe allows for measuring sewer flows from street level and measuring stream flows from low bridges, while the 2.5 foot collapsed length of the FP311 Flow Probe is ideal for carrying into remote flow monitoring areas. 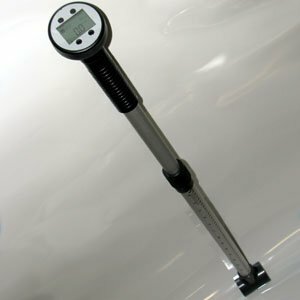 A 3 foot (1.7 foot for the FP311) mylar coated staff gauge (graduated in hundredths of a foot and centimeters) is attached to the lower section of the water velocity probe for instant water depth measurements and accurate propeller positioning. The Flow Probe Swivel Head option allows you to rotate the flow probe's turbo prop to +90 degrees from its standard position. This option lets the flow probe take water velocity measurements in hard to measure areas such as vertical pipes on water tanks or swimming pool drainage systems. Significant errors can occur when measuring water flow other than directly parallel to the direction of flow. The Flow Probe Alignment Fin is designed to help orient the flow probe parallel to flow when the end of the probe can't be seen well due to the depth or cloudiness of the water. To use this accessory, immerse the flow probe and rotate it back and forth until the least amount of resistance is felt due to the water flowing past the alignment fin. Note: Pole color of shipped instrument may be different than shown.